Northwestern’s tranquil Shakespeare Garden has added color, fragrance, texture and beauty to the Evanston campus for over 100 years. The garden is nestled in a quiet central section of the Evanston campus, just north of Frank W. Howes Memorial Chapel at the east end of Garrett Place, and directly east of the new Ford Motor Company Engineering Design Center site, the eight-bed garden is hidden from view by a double wall of hawthorn hedges. 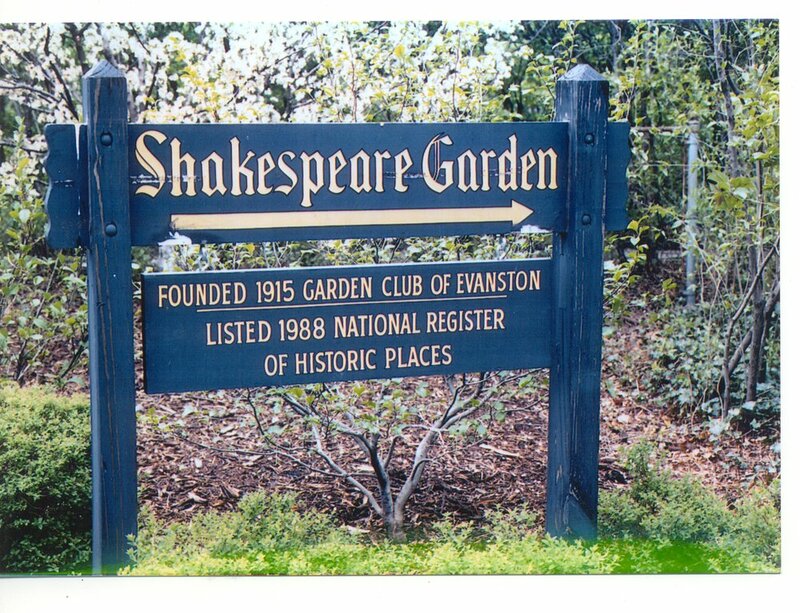 The 70- by 100-foot plot of land was established in 1915 when it became a project of The Garden Club of Evanston members because of wartime sympathy for our British allies and to commemorate the 300th anniversary of Shakespeare’s death. It was a way to celebrate the ties between England and America. Impetus to create the cultivated plot came from the Drama League of America when it was suggested that interested parties construct gardens memorializing the Bard to mark the tercentennial of his death. The Shakespeare Garden was designed by renowned Danish-American landscape architect and conservationist Jens Jensen (1860-1951), who is credited for the Cook County Forest Preserve system and both Garfield Park and Columbus Park on Chicago’s West Side. It was one of two formal gardens that Jensen designed, the other being the Rose Garden at Fair Lane, the Henry Ford estate in Dearborn, MI. He was inspired after reading Sir Francis Bacon’s essay on gardens. At the entrance of the garden, Jensen planted two Hawthorn trees, which served as a symbolic connection from the Prairie to the more formal garden. Planting was completed in 1920. The flowers, shrubs, trees and herbs in the garden are mentioned in Shakespeare’s writings and are varieties best suited to the garden’s location and Midwestern climate. Among the more than 50 plants that can be planted are rosemary, lavender, thyme, hyssop, rue, lemon balm, columbine, old roses, ox-eye daisy, anemone, daffodil, pansy, poppy, nasturtium and marigolds. Parsley, holly, ivy, mint and peonies are also allowed. The Shakespeare Garden still contains most of the original hawthorns that were started from seed in France and which form the formal garden’s base. The hawthorns of Jensen’s plan and the fact that it represents the type of project that flourished in 1916 conceived by the Drama League are the reasons the Shakespeare Garden was listed on the National Register of Historic Places in 1988. A new sundial was added to the west end of the garden in 1990 in memory of Jean Whitton Haskin, a former garden club chairman. Following a visit in 1990, John Brookes, a distinguished English garden designer and writer, suggested a few changes that are now reflected in the garden. The sundial was moved from the back to the center of the garden to create a more dramatic focus, and antique brick edging was added to give the center beds more definition. The Shakespeare Garden is no longer considered a knot garden because Brooks recommended removing some of the boxwood to create an opportunity for more mixed plantings, more emphasis on perennial plants, and a more natural look that mirrors the traditional English garden. The garden continues to be maintained by Garden Club of Evanston members, many of whom are Northwestern graduates. As the garden’s caretakers they periodically assess the color and the pattern to see which plants flourish and which languish. The Shakespeare Garden, the site of many garden tours, numerous marriage proposals and hundreds of weddings or wedding photo sessions, is open from dusk to dawn to all visitors. Follow the link below for more information. The last of the bee balm. A fall blooming crocus came out to say hello. Flower of this purple dye, hit with cupid’s archery, sink in apple of his eye - William Shakespeare. The lovely rose bushes are always at the ready to greet visitors at the entrance to the Shakespeare Garden. Evidence of worker bees 🐝 in the garden today.